This was my 60th marathon. You would think as a seasoned runner that I’ve experienced every detail and I know pretty much what to expect running a marathon. This was to me like my first marathon. 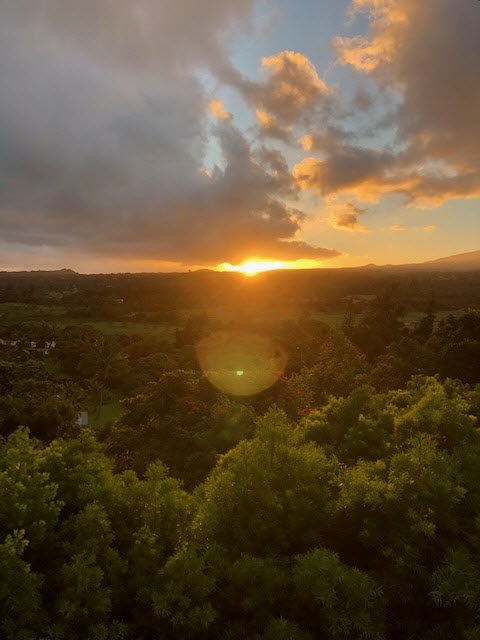 We arrived in Maui Thursday evening after traveling over 13 ½ hours on the plane. I was coming down with a cold so instead of my red wine, I was drinking a ton of water. I know, this is just not like me. We got the rent a car, drove to Safeway for essentials and then to the house we rented. I couldn’t wait for the sun to come up to see the magnificent views that were online. Waking up in Hawaii with the sunrise over the mountains is indescribable. There are different colors of orange peeking through the clouds on the mountain and the landscapes blends of deep greens and colorful flowers is just remarkable. To add to this beauty our house is nestled on top of a mountain where we can look out and see the ocean on one side and the majestic mountains are on the other. The view is incredible. Friday we drove to South Kihei to get our race bibs at the race director Les Wright’s condo. We met Les at the Napa marathon expo. He was an older gentleman that was extremely friendly. He mentioned in the earlier emails to participants to bring him a Corona with lime if we stop by his booth at the expo. We brought him a corona and it sure brought a smile to his face. When we were asking where to stay in Maui, he offered us a unit at his condo complex and gave us his phone number. Directions to pick up the bibs were pretty clear. Les sends participants multiple emails with details like I’ve never seen before, leaving no questions unanswered! 5. Go up the stairs into unit 28 and pick up your race bib. Marathoners will also pick up a license plate holder with your race bib. 6. Drop off any wine/beer bribes or penalties there. 7. Go down stairs and pick up your t-shirt. 9. Also you purchase a runners hat. 11. New registration is also upstairs. 12. Rent a headlamp for $10. Marathoners need one. 13. Take your shoes off and walk the beaches. 14. Take your clothes off and go in the water. There was nothing that we really needed to look up. He reminded us numerous times about the need for headlamps as well as to cut our toenails. 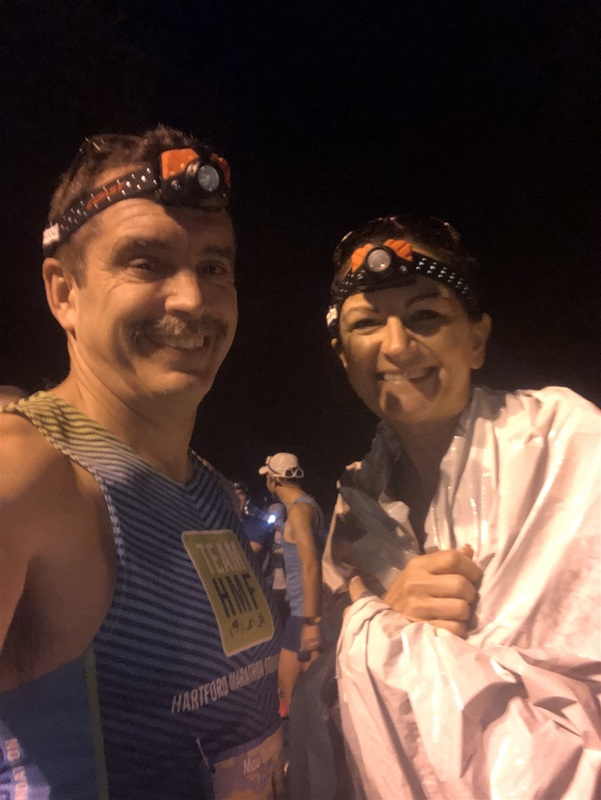 This was not your typical race expo as it was at his beach front condo, it was more like get your bibs upstairs and then go downstairs to get your t-shirts. There were hats, posters, and a few shirts for sale. He even had headlamps from previous years that people did not claim for sale. It was set up outside the entrance of the condo complex with tables. His neighbors must love him to allow this activity! We woke up at 1:00 am to leave at 2:00 am. We had to drive to the finish line in Lahaina to catch the bus back to the start. Just like clockwork the bus arrived and we all climbed aboard. This group was not your typical marathon group. They seemed more like a group of ultra-runners that were more laid back and an older crowd. 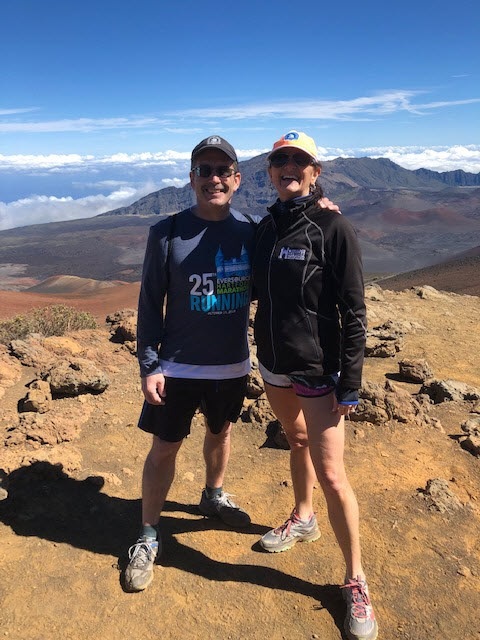 This race is a destination race for the 50 mile club where people want to finish their quest to run their 50th state in beautiful Hawaii. The smells of menthol muscle rubs were overwhelming. I sat there quietly listening to conversations of 100 mile runs and extreme running stories. 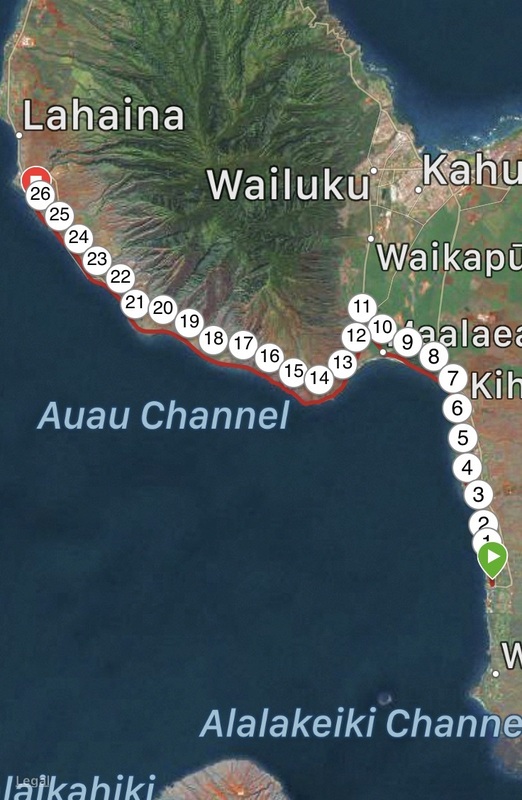 We set out on the 26 mile trip to Wailei to the marathon start. I was so tired that I slept sitting up for most of the ride. The time difference was pretty difficult to get used to. We got off the bus and walked thru the courtyard of the Wailei shopping mall to an open parking lot where the race director was standing in the back of his pickup truck making announcements. He immediately instructed the runners that got off the bus to where the bathrooms were located. It was pitch black except for the lights in the parking lot. This made it tough to maneuver in the port-o-lets. Good thing Les had us get head lamps! There were Tiki torches lit behind a group of local Hawaiians performing a ceremony to send off the early start runners at 4:00 am. Instead of the typical race horn they blew into conch shells to send them off. (I never knew they made such a unique sound!) As soon as that early start group were off Les continued with announcements. He announced all the birthday’s that day and the people’s names that were completing their 50th state. Our friend Beth Shluger from the Hartford Marathon foundation told us to say hi to him and give him a hug from her. We approached Les and he recognized us from the Napa marathon. We relayed the message from Beth and told Les we were on our honeymoon. He picked up his microphone and announced it was our honeymoon. Everyone cheered. He asked “did you meet running?” and Kim said “yes, and we are still running”. The authentic Hawaiian ceremony continued. It was performed by the locals who were wrapped in colorful prints with wreaths made of greens on their heads. They were singing in Hawaiian and every once in a while he’d say “Maui Marathon” and he would shake his palm tree leave at us, providing a blessing for the marathoners. When it was over they sent off the next group of runners (this was the 55 and older group) for the 4:45am start. Technically Kim and I could have started 15 minutes early but we wanted to be sent off with the larger group. The Hawaiians blew into their conch shells for their alert to start running and they were off. It was time for the rest of us to line up to start. 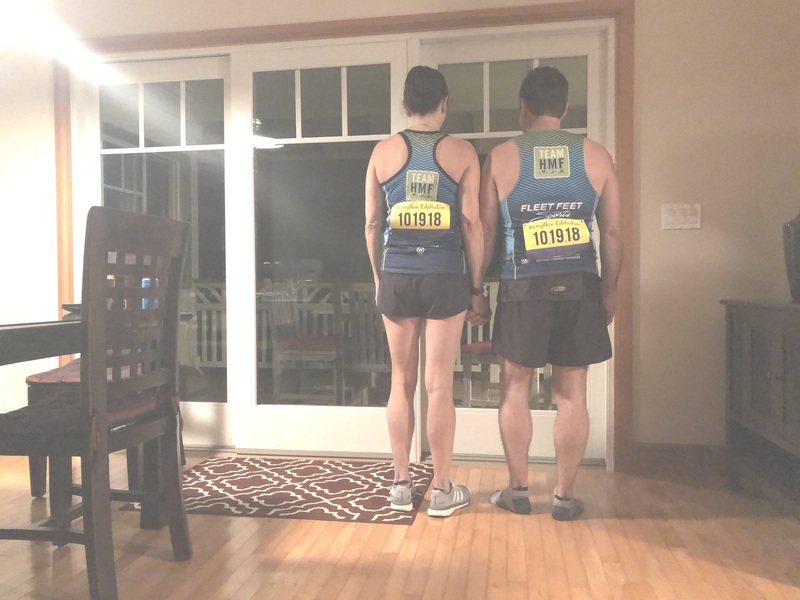 Les said “50 state marathoners completing your states get to the front of the line, Honeymooners Kim and Jeanne, get to the front of the line”. We turned on our headlamps and waited for the conch shells to start. We heard the noise that we thought was the conch shells and started to run but realized it was not time yet as Les has just dropped the microphone and what we heard was feedback from the speakers. It was pretty funny as the Hawaiians that were supposed to provide the start were yelling “no, not yet”! Finally, we heard the conch shells and we were off. It was pitch black! As I started to run my first thought was “this is not good, my legs are already tired”. I had been fighting a cold all week and was coughing pretty bad. The air was thick which didn’t help. Water stops were about every 2 miles stationed by local kids that would get a $500 prize if there water stop was voted the best by the participants. Some of them really outdid themselves. There were some table with oranges, banana, candy, grapes and assortments of cookies. Port-o-lets were not plentiful but they had them randomly throughout the course. The electrolytes was Ultima which I’ve never heard of before so I stayed away from drinking it until I hit the higher miles. I finally settled into a groove running where it felt like “sleep running” but we kept moving. This was the first marathon that I’ve run where the mile markers were descending. Instead of having mile marker 1 it was mile marker 25. I would like describe this marathon course in 3 different sections: “The dark section”, “The Hills (my favorite)” and “The Long Hot Death Valley” straight away section that went on forever. The Hills: I loved this part of the course! This section was a lot like the Big Sur marathon. We ran up rolling hills with the ocean on our left. This is where the whales can be spotted. I unfortunately did not spot any. There were runners stopping to take photos. It was spectacular. I shifted into my hill running mode and was feeling strong. My coughing had finally settled down. We ran through rock cut sections where there was huge mountains of rock on both sides of us. We ran through a tunnel in a mountain that was over 300 feet long. It wasn’t long, but long enough for me to get nervous and I kicked up my speed! After reaching the highpoint we headed down to the next section that I refer to as the “Long HOT Straight away” or Death Valley. Long HOT straight away: At the start, we were talking to a local woman who had run this race a few times she told us that the section that is the hardest is mile 19. Kim said “It sounds like what you’re referring to is running through Death Valley and she shook her head and said “yes, that’s exactly what it’s like”. Well, that is the best way to describe it. As we approached the higher miles I started to get overheated we started walking through water stops. We had taken more salt. We approached our first timing mat and realized it was the turnaround mat for the ½ marathoners. This was 19 ½ miles for us. This to me was what I would like to refer to as a cluster f*ck. We had to fight runners running towards us and then walkers we had to dodge with the oncoming traffic to pass. If we wanted to pass we had to run out of the shoulder and dodge cars. It was unnerving. Kim and I both were feeling the heat so we started with a walk run approach. This is where it got ugly. We had 3 miles left and Kim started getting horrible calf cramps. We were walking now and as soon as he attempted to run he cramped back up again. He was in awful pain. He stopped and tried to stretch and his legs that I noticed that his calves were shaking pretty badly. We pretty much walked the last 2 miles into the finish line. About 10 steps to go I thought “finally we are going to make it” Kim stopped dead. I could see the pain in his face. He couldn’t take another step. I put my arms around him to try to help him and we finally crossed the finish line. With all the pain he was in he made sure we put our arms up and smiled. They had a cooling mist for the runners as soon as we got our medals. There was a medic there that notice Kim. Kim said “I was standing there feeling better under the mister and suddenly I felt someone grab my arm and pulled me out of there”. It was a medic that walked him to the medical tent. They immediately laid him down with his legs up and put ice packs on his head and neck. His calves looked like there were aliens in them. He was having wicked muscle spasms. This is when the nurse came over and said we need to administer an IV. They couldn’t find a vein because of his dehydration. It was pretty scary. He was shivering and shaking still and said he was cold as I stood there sweating. Finally after the IV started to take affect the nurse looked at Kim and said “Wow – you have your color back”. I forgot to mention the color had drained his face. I told her “This is his 74th marathon”. We made sure we drank at every water stop and took salt. She said “this happens quite frequently when you travel so far and also the time change”. They gave Kim the okay to get up and he said “no wonder I was freezing, the ice packs they gave him for his head and neck had slid down to his lower back. So he was sitting on ice for a good hour! I learned a lot from this marathon. No matter how seasoned a runner you are, there is always something to learn. In retrospect, if I ever have to travel long distance for a race, I’ll be prepared for the time change and dehydration factor. Changing what we do during the run would be the difference. I started drinking the electrolytes around mile 18 where Kim had not. He started to when the cramping started. By this time it was too late. Also, I recall him saying “I wish there was another water stop before the finish line, so maybe carrying a hand help would have helped us.